Awesome, saved me a ton of time. Thanks for writing this up! First all all I would like to thank you for putting this tutorial together because it has really helped me (a beginner to drupal) to get my gallery site up and running without problems ! Ok now I would like to have my images filtered by category. I had a look online regarding using the Taxonomy module to filter my images, but got lost on the way. I setup taxonomy module but couldn’t get the dropdown menu(to filter my images by category) to appear on my Gallery page. I set the Filters prop. of the Gallery view to NodeType=Image..Please help !!! Thanks for the tutorial, I searched a lot of them and your gallery looked the best and the instructions the easiest. I made this gallery and it almost works, but when I click on the thumbnail the lightbox doesn't come up; instead a huge dark box appears at the bottom of the page and then the photo shows up underneath! All the modules are up to date, any idea what could cause a problem like that? @Paul, it looks like there is a problem with your custom theme somewhere. The lightbox stuff is loading up OK, so I assume it will be something in your CSS. when you're in Views you need to add your relevant taxonomy vocab in 'filters' and expose it. Once that's done you need to change your 'Exposed form in block:' option form 'no' to 'yes' under the 'basic' settings' menu. the thumbnail are too close to each other. At the time of saving the view browser display this message "Display Page uses a path but the path is undefined." @Shelly, It will be down to your theme, alternatively you can use less images per row to spread them out a bit. @Kingfisher, Did you definately save the view after setting the path? This was the first tutorial that worked for me as far as Drupal was concerned. But it seems pretty painful to upload a plethora of images. Is there a way to facilitate more images at one time? I've got a lot I need to get up but just uploading the 4 for this demonstration took minutes individually. @Justin, Yes you can upload multiple images at one. You will need to use the Image FUpload module and use that rather than the CCK Imagefield. Thank you very much for this useful tutorial!! you rock dude. I have been looking for this solution way too hard. node gallery... views attach... gallery2... acidfree... blah. This is the simplest way. I will now use panels 3 to create the style i want. awesome. Veri good tut for me! Hi. Having a problem. Under the CCK Imagefield area I was successful until this line: Now under /node/add/image we can add an image to go in to our gallery. I cannot make that Create Image page appear! Everything else to that point worked fine. Anyone else have that problem? What did you call your image node? Alternatively, rather than using that URL use the Create content menu item in the navigation menu. Thanks for giving that kind of clear demo. @Linda, That will be a problem with your installation. Try downloading and updaing views. Huh. Would never have thought of that! Thanks - I'll give it a try. This is a great tutorial. I'm looking for this and a bit more though. I would like to have multiple galleries and a page that lists a thumbnail and a description to access each gallery. Is that possible? 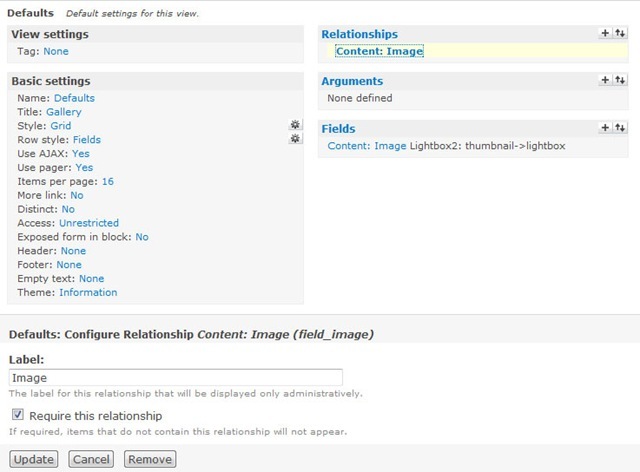 Why are there sooo much complexities to adding a simple gallery in Drupal?? It takes eight modules to do this? 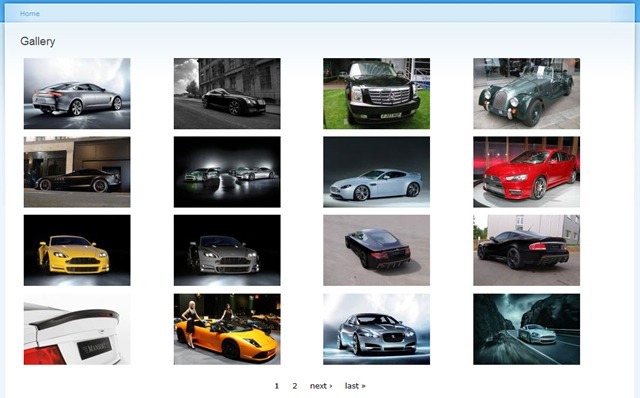 @Brian, Have a look at my Create an album based image gallery in Drupal 6 using CCK and views tutorial on how to do that. @nexus74, No, it doesn't take 8 modules to get a simple gallery in Drupal. It takes 8 modules to create a simple gallery using this method which allows a lot of customisation. There are modules that do galleries in Drupal with one module, but this allows flexibility and can be changed to work in many different ways. Thanks! - found it, and will give it a whirl this evening. Is there a link to the result? Is the section after - http://jamestombs.co.uk/2009-06-25/creating-a-grid-of-images-for-an-albu... necessary, or can the grid view be modified via the view? Thanks for your well documented tutorials and quick responses! @Brian, I think you can do it through the view, but you would have to look for some sort of node override within Views. The grid using PHP is a way to do it, but like with most things Drupal there are many ways to most things. Sorry, no link to a demo, it should look very similar to the simple gallery except with the description/gallery title under/above the image. So I finally did my upgrade and the gallery magically appeared! Still needs work, but at least I have something to work on, now. Thanks so much for the help! Excellent Tutorial, Easy to follow! Few follow up queries about added functionality..
How hard is it to create multiple galleries? Rather than having just 1 big Gallery i would like it that my user could create a gallery and then stipulate which gallery they can upload the files to. Another query is, what is involved in having a comment box, much like this one, where users can comment on single images? Whoops. noticed my first question is answered in another tutorial on this site! How silly of me. hey, why there is a broken link of images appeared in my page..I cant see the imgae I have uploaded. @sam, make sure you have write permissions to your files directory. Thanks so much for this tutorial, I'm going to look into the album based one now! I have one problem though, I don't get the previous/next links in the Lightbox popup. Thanks for the tutorial - the output is exactly what I was looking for, and easy to theme for my website. BUT, I have a problem - the images I uploaded when into /default/files and /default/files/imagefield_thumbs instead of under imagecache. The thumbnails, etc are generated correctly but put into the wrong directory. I've been through the tutorial twice. Any thoughts? @Jeff, I have looked at your site and your images are being created in the imagecache directory. When you upload an image using CCK Imagefield it is placed in your files directory unless you specifiy another directory within the CCK field settings. Copies of the image are created in the Imagecache folder with the settings applied to the image. Any ideas on how to get captions to show up, either in the main gallery or in the Lightbox popup? @admin - regarding the path problem: my fault, I didn't see there were older pages of comments. The changing of the file system to "private" fixed it on my test system. Thanks! I got everything to work correctly; however, there is no paging going on. Pager is set to full, ajax enabled and 9 items per page. There are around 45 images total and all are viewable in admin/content and all show up if I set total number per page to 45. It just seems page 2-5 (with my current 9 img per page setting) won't load. Any thoughts? Oh, and thanks for the outstanding tutorial! @bstrange, I can only assume it is down to your theme. Try setting it to Garland and see if the pager shows up properly. "warning: call_user_func_array() expects parameter 1 to be a valid callback, function 'imagecache_ui_preset_add_form' not found or invalid function name in D:\Apache\xampp\htdocs\drupal-6.15\includes\form.inc on line 372." the theme *IS* actually garland with heavily modified graphics to give the appearance of a custom theme. No significant changes to css or additional files added. Thanks again for the GREAT tutorial and help figuring this out! Ok this is probably a stupid question, but do you have any idea how I would place a very thin border w/padding around the thumbnails? I am pretty sure it would be done through css, but I'm not sure where to start. @sheta gusain, looks to be an issue with Imagecache. Make sure the correct version is installed for your Drupal installation. That will add a 1px red border with 5 pixels of padding between the thumbnail and the border. check out the instructions on post 12 on this forum post. once you do follow those steps, you need to have the field in your view use "Lightbox2 iframe: thumbnail->node page". then, copy the page-node-lightbox.tpl.php into your theme and take out all the wrapper stuff.